Just when you thought the kick off to the new NFL season didn’t need any more controversy, enter the Nike Corporation. Nike has announced that its “Just Do It” ad campaign will in fact feature the former NFL player and original anthem protester Colin Kaepernick. 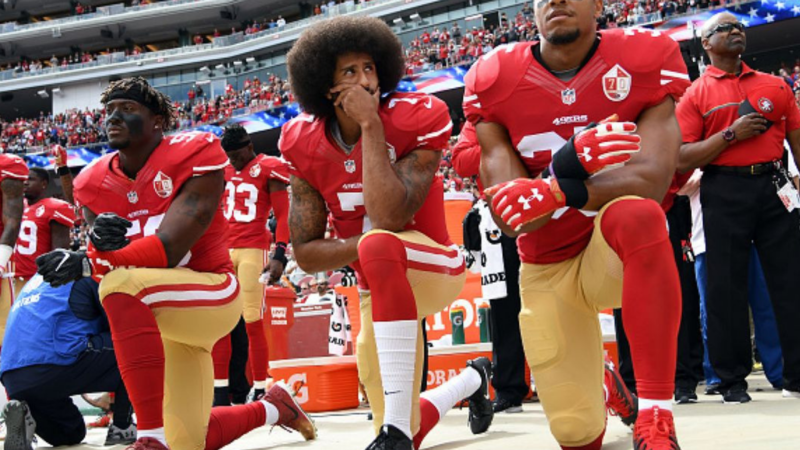 They are featuring the tag line with the campaign: ‘Believe in something, even if it means sacrificing everything.’ Sacrificing everything; yeah, he really sacrificed that NFL paycheck that was paid for by the fans that he repeatedly insulted. We have a member over at our Turley Talks Facebook Group that, I think, said it best. If Nike’s interested in an athlete that sacrificed everything for what he believed, thy should be featuring a picture of Pat Tillman. Needless to say, many NFL fans are not sitting back and letting this one go; social media is awash with pictures and videos of people burning their Nike foot ware in their own forms of protest, in their own forms of taking Nike at its word. We stand here on our beliefs even if it involves sacrificing these Nike sneakers. Of course, this is not the first time that corporations have done this; in fact, from the NFL itself onwards, it seems that corporate America almost has a love affair with politically correct social justice warriors. I don’t know if you remember when the North Carolina legislators were considering a bathroom bill that actually had the audacity to affirm that there really are only two genders, you had corporations such as Apple, Starbucks, Kellogg’s, and PayPal who, along with over 100 CEOs, signed an open letter urging the repeal of what they called this “discriminatory and radical new anti-LGBT law,” and they all promised to boycott North Carolina. Now the corporations are actually boycotting here. I am often asked what is going on here? Why on earth are corporations like Nike doing this? Why do CEOs care so much about siding with political correctness and social justice warriors? Why do they act as if they have a dog in this fight? Of course, at one level, the answer is rather simple; it is because the corporatists are cowards; they cower in the face of threats from these social justice warrior bullies. But I believe there is something deeper going on here, that if we miss, then I think we in turn end up missing the key solution to all of this. If you are a regular reader of mine, I am sure you have guessed the answer; as always, I think the key to understanding this corporate solidarity with politically correct social justice warriors is of course understanding the mass political and economic process known as globalization; in other words, if you do not understand globalization, you are not going to understand what these CEO’s and corporations are doing and why they are so enthusiastic about embracing all things liberal. Simply put, globalization is a vast interlocking mechanism of technology and telecommunications that creates a single worldwide economic and political system. That is globalization; As I have talked about this on a number of occasions, what you have to understand about globalization is that it involves a key defining social dynamic known as disembedding. It is a fancy word a rather simple concept. Disembedding involves the propelling or the dislodging of social and economic life away from localized control and relocates it in more transnational transcultural processes. I like to use the local shopping mall as an example of this. Think of your local mall: in one sense, the mall is of course local in terms of its proximity to consumers; but if you think it through, notice that all the retail outlets that comprise the various stores at a mall are anything but local. This is what makes a mall the mall! they are rather national and international chains and brand names. This is especially the case with the latest releases at the movie theater or the offerings at the food court. If there is a movie theater at the mall, I can assure you that it is not showcasing local acting talent, that is for sure. This is what is called disembedding: from the ubiquity of ‘Made in China’ imprints on our products and consumables, to the mass influx of immigrant labor, both legal and illegal, and the ever-increasing ‘Orlando-ization’ of our urban and suburban landscapes by chains and franchises, our lives are increasingly defined and interpreted by translocal economic and social processes; this is a hallmark, a defining characteristic of globalization. The key is that it is not merely economic processes that are arrested and dislodged and separated from local control; disembedding also involves localized customs, traditions, languages, and religions. Whereas premodern societies are characterized generally by provincial beliefs and practices considered sacred and absolute, globalized societies offer a range of consumer-based options that call into question the sanctity of local beliefs and practices, relativizing them to a ‘global food court’ of many other creedal alternatives. You see, in globalized societies, local customs and traditions can be easily exchanged. Indeed, you are encouraged to exchange them for wider translocal, transnational options and practices. What this disembedding of localized customs and beliefs does is it creates a new conception of the human person as fundamentally a consumer, a sovereign individual who exercises control over his or her own life circumstances. Follow the logic here; globalism disembeds, it dislodges or separates economy and culture from localized control, and in so doing, it replaces the traditional conception of the individual, who is understood in relation to unchanging identity markers such as family, community, culture, and nation, all bound together by religion. Disembedding replaces that traditional conception of the individual with a new conception of the individual which is fundamentally conceived of as a consumer. And, as a consumer, now everything else is secondary. Everything else is now a matter of consumer-based choice. So, under the system of globalization, I am ‘free’ to choose not only my religion, or my career or my spouse. I am free to choose my culture, my causes, my gender, my sexuality, my family planning, on and on and on. That is the globalist vision of the sovereign individual, the human person redefined fundamentally as a consumer. This is why Colin Kaepernick is celebrated by our corporate elite. He is celebrated because, in terms of his public protests, he is exercising publicly his sovereign individuality; and as such, he is showing to the world what it means to be redefined fundamentally as a consumer. That is why corporate America loves Colin Kaepernick. What do we do with all of this? Well, more and more people are recognizing that there is power in their purses, and so they are increasingly engaged in what scholars call political consumerism, and that is where we actually are intentionally voting our political commitments. This generally involves what are called boycotts and buycotts. Boycotts are obviously the intentional refusal to purchase from companies that offend our political values, while buycotts are intentional purchases from companies that support our political values. This is the increasing partisan nature of the marketplace; companies are more and more being divided up between liberal corporations and conservative corporations, such as Chick-fil-A, Hobby Lobby, Cracker Barrel, Carl’s Jr., and Urban Outfitters. So here is a suggestion; why don’t you click on the link below and get yourself a pair of sneakers from New Balance, whose CEO contributed to the Trump campaign. They are currently on leftwing boycott lists, so let’s go ahead and BUYcott from them; and by clicking on that affiliate link below, you not only support conservative causes, but you get to stick it to those who do not, all the while getting a nice pair of new sneakers. Welcome to the age of political consumerism. College Enrollment Continues to Plummet: Here's Why!! !